Minor adjustments to six TriMet bus lines and one early morning MAX run begin December 4 and 5 to improve connections but the biggest change coming will be the return of buses to the Sellwood Bridge. 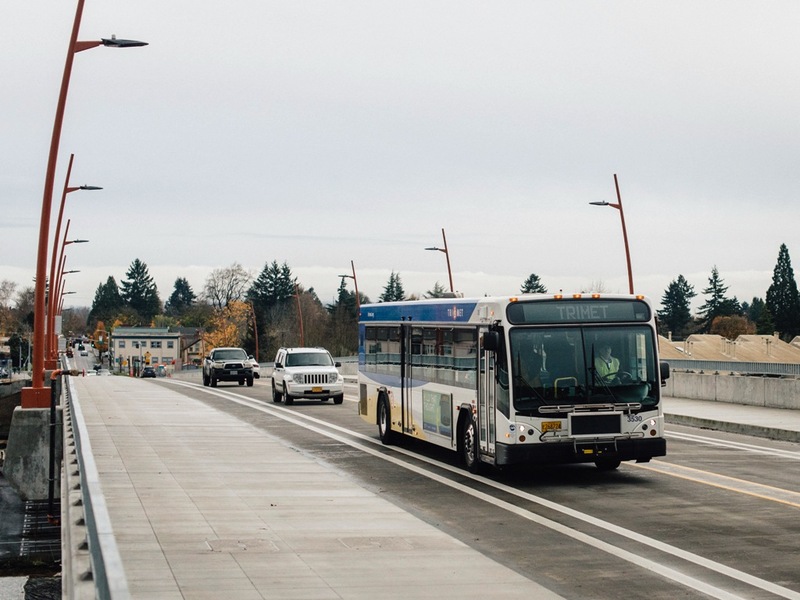 Line 99, which runs currently from Clackamas Community College (CCC) to Portland City Center via the Ross Island Bridge during weekday rush hours, will transition to a new route across the Sellwood Bridge on Monday, Dec. 5. This service connects CCC, Milwaukie, Sellwood, John’s Landing and Downtown Portland. The change also brings new stops on SW Macadam and SE Tacoma. Lines 35/36 will make minor location changes to their stops at the west end of the bridge to make easier connections with Line 99. Click here for more information. Use TriMet’s online Trip Planner to find your best transit options, including walk times, transfers and cost. Visit trimet.org on your computer or mobile device for complete transit information and check TransitTracker for the next arrivals. Line 30 – First trip of the weekday morning leaves Estacada five minutes earlier to improve connection with MAX Green Line at Clackamas Town Center. Line 34 – Minor route change to serve stops on SE Monterey Ave between 82nd Ave and Fuller Rd. Minor schedule adjustments to better match ridership and traffic conditions. Lines 35/36 – Minor stop changes on SW Macadam at west end of the Sellwood Bridge to connect with Line 99. Line 46 – Printed and online information, including schedules, will reflect the name change of Hillsboro Main Library to Hillsboro Brookwood Library. The route remains the same. Line 57 – Last trip on weekdays to Forest Grove leaves 10 minutes later to allow better connections with Line 20 at Beaverton Transit Center. Line 99 – Route change over the Sellwood Bridge and serving stops on SW Macadam, SE Tacoma. MAX – First westbound trip of the weekday departs Ruby Junction/E 197th Ave MAX Station at 3:21 a.m., six minutes earlier. At Gateway Transit Center, this becomes a Green Line bound for PSU, which turns into an Orange Line at Union Station continuing to Milwaukie. All subsequent first stops westbound along that trip will be six minutes earlier. If you’d like to help TriMet shape future service, we’d like to hear from you. The comment period for bus service proposals for Fiscal Year 2018 is now open. Visit trimet.org/busplan to see all the details, weigh in and sign up to receive email updates. You can also email comments to comments@trimet.org or call 503-238-RIDE (7433), Monday – Friday, 8:30 a.m. – 4:30 p.m. The deadline for receiving comments is December 31, 2016.